Entry No. 459, Episcia lilacina 'Blue Nile', exhibited by Arleen Dewell. Score: 93. First Place. Entry No. 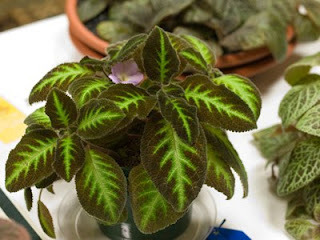 117, Episcia 'Silver Dust', exhibited by Carol Hamelink. Score: 92. Second Place. Entry No. 379, Episcia 'Karlyn', exhibited by Richard G. Carr. Score: 82. Third Place.